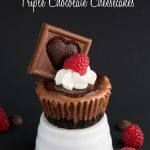 I first shared this recipe on The Recipe Critic where I am a contributor. 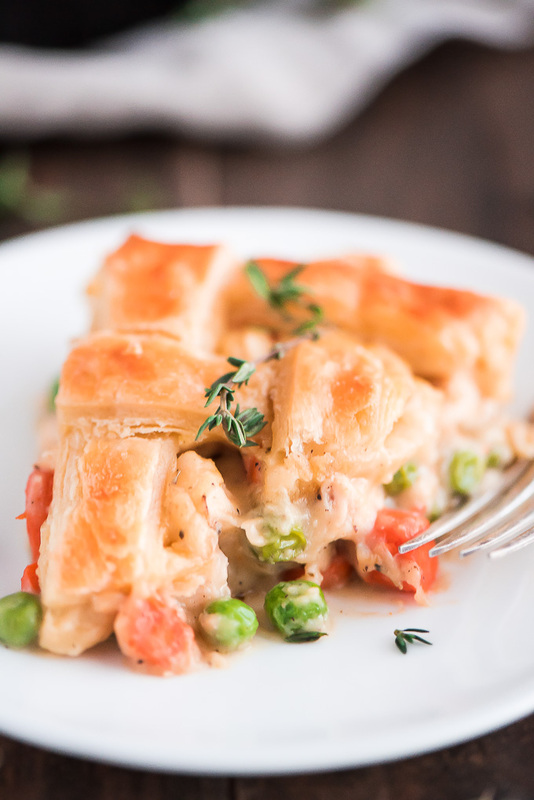 This super Easy Chicken Pot Pie is a comforting family favorite meal made easy by using only one skillet and topping it off with a delicious flaky puff pastry crust. 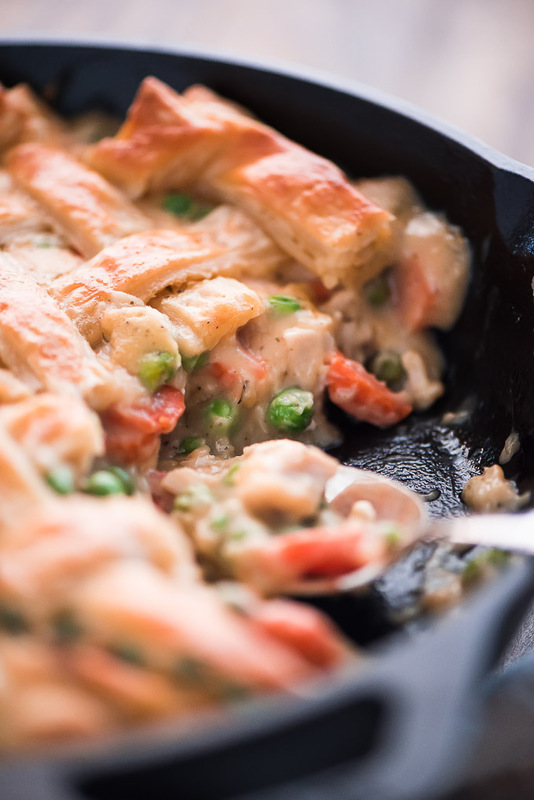 If you’ve never made homemade chicken pot pie, you must add it to your menu for this next week. 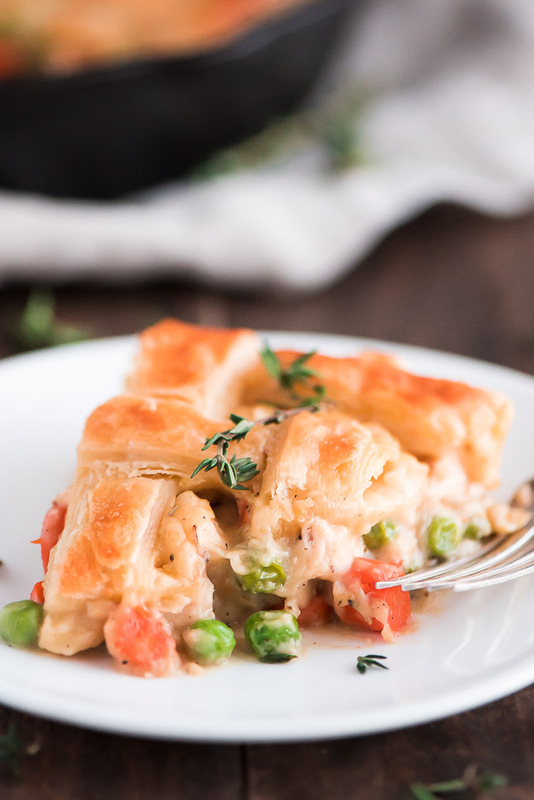 A classic, made from scratch, double crust chicken pot pie can take some time but I have created this one skillet Easy Chicken Pot Pie to make it manageable. 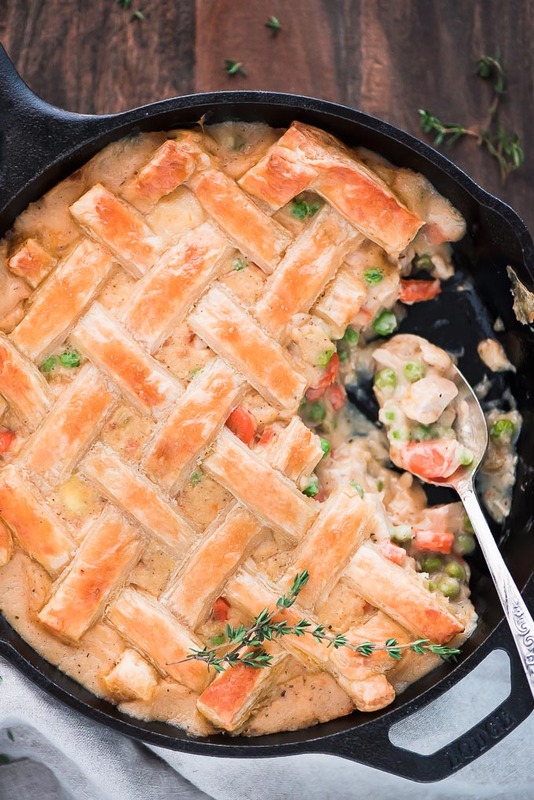 A classic chicken pot pie requires you to make a double crust, use a pot and a pie plate but his recipe, just ONE pot. 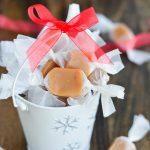 No pie plate needed AND you don’t even have to make your own pie dough, just use puff pastry dough! Less dishes to do and it tastes amazing with the puffy flaky crust on top. I don’t recall ever having chicken pot pie as a kid, probably because my mom knew I wasn’t a fan of dessert pies. Let me tell you I am a huge fan of savior pies. Shepherd’s Pie and Chicken Taco Pie are my jam! I’ll take a slice of a savory pie over a dessert pie any day… okay that a lie. 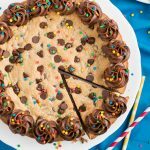 If it has peanut butter or ice cream than I’ll choose the dessert pie. This is a classic comfort dinner. It’s the exact meal you want on a cold winter evening. It’s warm, creamy, filling, and has soft flaky bread topping. 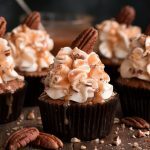 Can you even have a carbless or dairy free comfort food? Bahaha! Now, just because this is a comfort food doesn’t mean that it’s all bad for you. It has lean chicken breasts, lots of veggies, and only one crust instead of two. There’s quite a bit of butter involved but… life is better with a little butter. Am I right? And you’re not eating this everyday, even though you’ll want to. 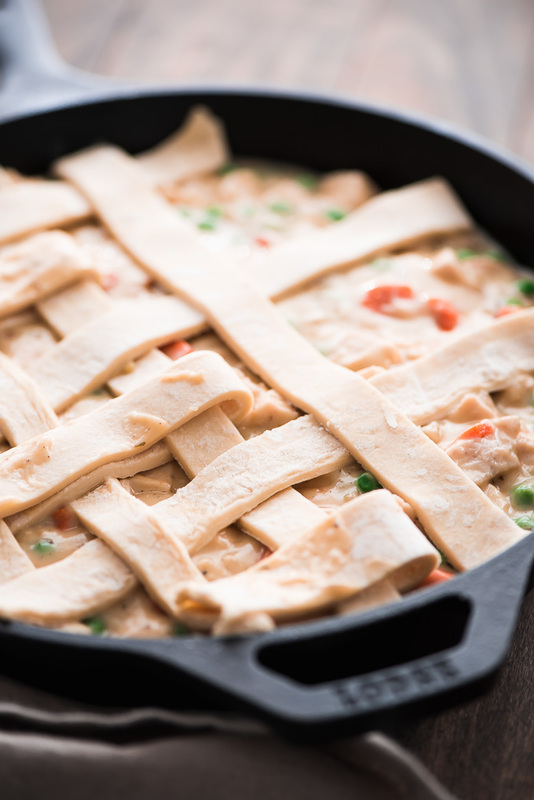 To prep the chicken for this pie you can use leftover shredded chicken, rotisserie chicken, turkey, or bake or slow cook a couple chicken breasts. Melt butter in an ovenproof* skillet and add the onions and celery. Cook for 3-5 minutes or until onions are translucent. Add the carrots and garlic and cook for 2-3 minutes or until carrots are fork tender. Stir in the flour and seasonings and cook for 2 minutes while stirring. Add the chicken broth a little at a while whisking until smooth. Whisk in the milk and bring to a boil. Simmer for 2-3 minutes or until thickened. Mix in the chicken (or turkey) and peas and flatten the filling to create and even surface. Slice the puff pastry dough into 12 even strips. Lay strips on top, weaving them together. Whisk egg and water together and brush on top of puff pastry. Bake for 25 minutes or until golden brown. Let sit for 5 minutes before serving. 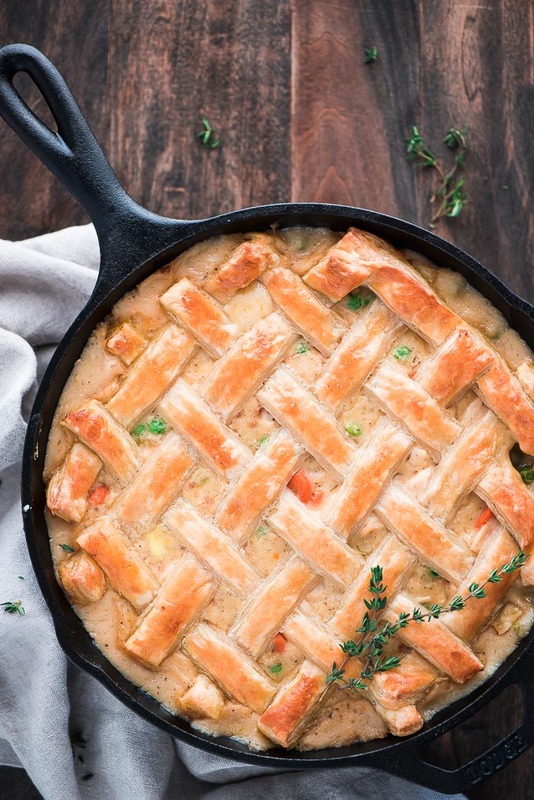 *If you don't have an ovenproof skillet like a cast iron skillet, just cook filling in a normal skillet or pot and transfer to a pie dish before topping with the puff pastry.